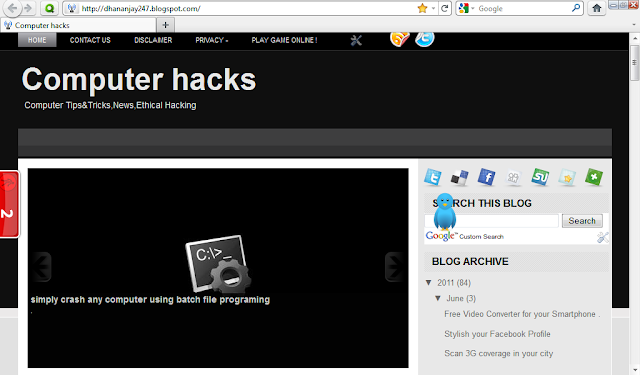 Home » website » Most Popular Articles on Computer hacks. Most Popular Articles on Computer hacks. blogging was hard for me for several Months when i started blogging , on these days i don't know about seo , hacking :D , and blogging . i think all geeks should have to know about this stuffs , but only for educational purposes . because after learning ethical hacking or just reading some few articles or tutorials on hacking , they will start hacking in reality ! to just share some screenshots on Facebook :D .but did you know if this kind of hack attack runs on major sites like sony , you will defiantly get busted soon ! if you are a script kiddie ! recently Spanish Police Arrest Three Sony Hackers ! Google it for more info . by the way my blog is not about full on hacking or any other stuffs . my blog is about my own research on different trick or poor hacking ways :) . actually my blog is started on May 2009 but i deleted some articles on my blog . so here i'm sharing my top 10 articles.
" 2010 November – 2011 "
Hack idea net setter ! Scan your Facebook profile . Increase buffering speed in you tube. share it if you like it .